This year’s harvest of grapes benefits from lots of rain and heat. WOODS BAY – To hear Don Goodspeed tell it, this year’s wine grapes are going to be great. Goodspeed, who owns a vineyard on Flathead Lake 1.5 miles south of Beardance Trail, is excited. Goodspeed, 76, worked in computer maintenance and repair for IBM for 30 years before retiring to Montana from Rye, New York. He built a two-story home on Flathead Lake and planted French Vinifera varietals close to the lake – which produce Riesling and Regent grapes – and Frontenac and Vidal Blanc grapes higher up the hill. This year he added Petite Pearls. Goodspeed has had success at producing wine. On March 31, his Beardance Riesling was named the Montana Grape and Winery Association’s best white wine. Not many Flathead Lake-area vineyards grow Riesling grapes, said Larry Robertson, a soil conservationist with the U.S. Department of Agriculture’s Natural Resources Conservation Service in Ronan. The French varietal is not a cold-hardy grape, but Goodspeed can grow it because his vineyard is close to the lake where temperatures don’t get below zero, Robertson said. 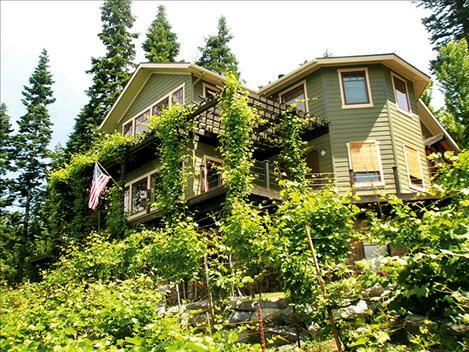 Goodspeed has nearly 500 vines on his one-acre property that slopes steeply from Montana Highway 35 to Flathead Lake. He notes that harvesting is very labor intensive and includes no mechanized equipment other than a weed-eater. Goodspeed plans to offer a winemaking class on his property in September or October. Students will spend a day picking and processing grapes, the latter with a crusher/de-stemmer and winepress, and then add yeast. They will return in 7 days to put the product into containers and then in 45-60 days to pick it up. The class will cost about $120 and up, Goodspeed said, depending on how much wine one wants. To enroll in the class, call 406-249-8577 or email dcgsailing@gmail.com.